Munro waited for all of the police and EMS to leave the scene before he attempted his search. It happened again, a woman this time, tried to beat the train at the crossing and the train won yet again. He wondered why people do that; why do they think they can win? Why can’t they wait that extra minute? The tracks went over Spinner Street, by the Walmart and an open field. It was dark by the time the area cleared and the road reopened. Munro took his flashlight and crisscrossed the field. Then he found it: a shoe. A stained canvas flat that was cleanly knocked from her as she was knocked by the train. In his basement, a wall was filled with a variety of shoes and sizes and newspaper clippings telling of accidents – people killed by the train. Munro rested the flat on a prong near the others and regarded his collection. When will they learn, he thought as he ran his finger over the newest shoe. But, their loss, he thought. 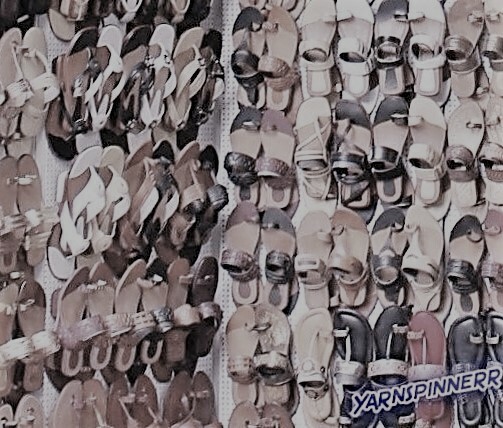 THE SHOE COLLECTOR is my submission to the weekly writing challenge by Flash Fiction for Aspiring Writers (https://flashfictionforaspiringwriters.wordpress.com/2018/09/24/fffaw-challenge-184th/). This week’s photo prompt was provided by Yarnspinner. The goal of the prompt is to write a story based on the photo. The story must be 75 to 175-words. This story’s word count: 175 words. Copyright © 2018 E.F. Olsson. All rights reserved. A morbid collection. One wonders if he has something to do with their accidents? Chilling! He collects the shoes of the dead! Like Iain said,very morbid! Great story, E.F.!